The new airline, which is targeting a younger clientele, was formally launched on Monday September 25, 2017, when details of the flight scheduleswere revealed to the press in Paris. It was announced that Joon will operate thrice-weekly flights to Seychelles, exclusively on behalf of Air France, using its Airbus A340-600, to be replaced by an A350-900 by 2019. Seychelles is among two long-haul destinations which the new subsidiary airline will be flying to as from summer 2018. Joon will also fly twice-weekly to Fortaleza, Brazil as from May 4, 2018. Speaking on Europe 1, one of France’s leading radio, the Chief Executive of Air France, Franck Terner confirmed that Joon fits between a low-cost and classic airline and will feature a business class section for its long and medium haul flights. For the long haul routes, which is the case of Seychelles, the flight will be more of a normal all-inclusive experience. 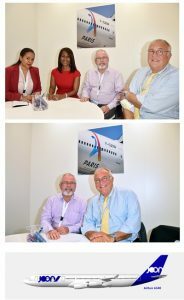 Following the announcement, the Seychelles Minister for Tourism, Civil Aviation, Port and Marine, Ambassador Maurice Loustau-Lalanne, met with Air France’s Executive Vice-President for Commercial, Sales and Alliances, Patrick Alexandre on Tuesday. Minister Loustau-Lalanne is currently leading the Seychelles’ delegation to the annual IFTM Top Resa tourism fair in Paris. His discussions with Mr. Alexandre centered on ways that the Seychelles Tourism Board (STB) and the national carrier, Air Seychelles, can work together with Air France to ensure that the route is successful and beneficial for all. The meeting was also attended by the Air France team in charge of alliances and cooperation and on the Seychelles’ side by the Chief Executive of the STB, Sherin Francis, and the Director for STB Europe, Bernadette Willemin. Minister Loustau Lalanne believes that the new air link will help to grow a specific segment of the tourism sector, through the kind of clientele that Joon will be attracting. Joon which is designed to meet the expectation of the new generation of travellers, will be offering 3 travel classes: a business class, premium economy, and the economy class. According to the national bureau of statistics, France has sent 29,356 French visitors to Seychelles up to September 20 and is currently contributing the second largest number of visitors to the island destination, after Germany. While the arrival figures show a 2 percent decrease compared to the same period in 2016, France, which has long been the main tourism market for Seychelles remains an important source of visitors to the island destination. To note that the national carrier, Air Seychelles is currently operating direct thrice-weekly flights to Paris. As of May 2018, Joon will also be flying directly to the island nation leaving Paris on Mondays, Wednesdays, and Saturdays at 10 am arriving in Seychelles at 10.30pm. The returning flights will be leaving Seychelles at midnight the following day, to arrive in Paris at 8 am, a perfect timing for onward connection to other destinations within the Air France-KLM network. Ahead of its 2018 schedule, Joon will take off to four European cities as from December 1, offering 51 weekly flights to Barcelona, 37 weekly flights to Berlin, 28 flights a week to Lisbon and thrice weekly trips to Porto.